Bear Paw Studio Retreat is located on a beautifully secluded 20 acre private forest, with only a two mile drive to Soldotna boasting an array of coffee shops, grocery and specialty shops and restaurants. Bear Paw is located in the lower level of our home, has a private entrance, designated parking and plenty of parking for tenant boats or extra vehicles. With king and queen beds in the sleeping area, Bear Paw Studio comfortably accommodates two to four guests. Bear Paw Studio is a recently completed addition to our home, so it is new with modern kitchen appliances and lovely Alaskan decor. Complete with a very large bear hide covering an entire wall! Black out window coverings provide sufficient darkness during our bright summer months allowing our guests to get a good night's sleep. There is a large freezer exclusively for guest use, which is particularly useful during fishing season. Fish cleaning, however, is prohibited on the premises, due to potential attraction of bears. During the summer months, Bear Paw is a perfect fisherman’s retreat. In winter, when snow is abundant, we maintain several cross country ski trails and have a fabulous sledding hill for those who desire snowy adventures. Bear Paw has something for everyone traveling to the Kenai or Soldotna area. Contact Jackie with any questions or for more information! We are Jayson and Jackie Kempf, the property owners. We were both born and raised on the Kenai Peninsula and grew up enjoying the many outdoor activities "Alaska's Playground" has to offer. We spend our summers fishing on the Kenai and have a total blast filling our freezer with our winter supply of Sockeye salmon. We enjoy camping around the state of Alaska during our fair weather months and traveling to warm and tropical destinations during our cold months when time allows! Full bathroom, nicely appointed with shampoo, conditioner, soap and all basic amenities you will need for your stay! Radiant in floor heat feels wonderful after a day of cross country skiing on our groomed trails, sledding on our hill, or if you want to cozy up on the couch with a good book and be toasty and warm. Washing facilities are available upon request and only available when owners are on site. Laundry services are also available in Soldotna. Dryer use is available upon request, not located in the unit and only available when owners are on site. Keurig and starter supply of coffee pods provided in unit. Typical condiments, seasonings, etc. . . available. Full kitchen with new appliances and everything needed to prepare your daily catch from a day on the river! Gas BBQ grill available. Direct TV with many stations for varying interests. Apple TV also available upon request. Large library of cookbooks and Alaskana books available for guest enjoyment. 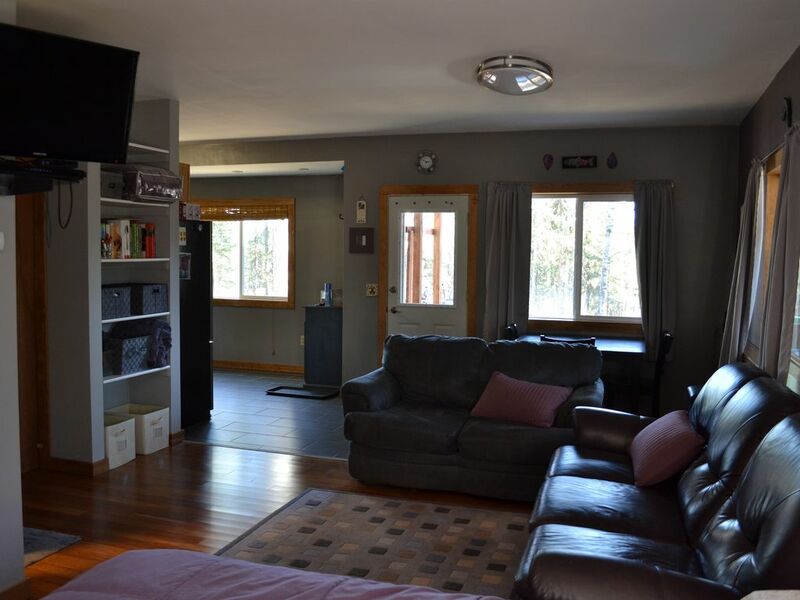 20 acre property has very large lawn area surrounded by woods for hiking and exploring. During winter months, cross country ski trails are maintained routinely. Bicycles may be used upon request. We maintain several cross country ski trails when snow levels are sufficient for skiing. Cross country ski equipment rentals available in Soldotna. Golf course less than 2 miles from Bear Paw Retreat. Golf rental equipment available at Golf Pro Shop. It was spotless and a quiet place to sleep. Just a perfect amount of distance out of town. We won’t be staying at the aspen again for swim meets 😉�. Thank you! Our favorite place to stay in Alaska! The location was perfect, we couldnt have picked a better spot! So peaceful and quiet! We walked into the apartment and were immediately impressed. It was extremely clean, and gorgeous! There were dishes in the cupboard, food in the fridge and pantry, books and movies on the shelves...it was like a home away from home. If you need a place to stay in soldotna, stay here, you will love I! I've never been to a nicer, or more comfortable, hotel! Thanks for everything Jackie! Thx, Sarah! We very much appreciate your kind words and you are welcome back anytime!! It was such a beautiful place to stay and relax. It was wonderful meeting you and hosting you! Hope you enjoyed your AK adventure! Exceptional hospitality from Jackie and Jayson along with this super private and comfortable condo in the woods. We had excellent beds and a well equipped kitchen w a really quality gas stove which was fun since we cooked on our trip. J and J provided some really helpful tips on fun places to visit and hike and also on local restaurants. Highly recommend the Russian River hike as we saw the salmon jumping up the falls. Saw lots of great art and fishing! Really a great home away and we will stay there again when we get back to Soldotna. Jackie and Jason were wonderful hosts. We felt more like houseguests than tenants! Wonderful place! The kitchen had everything we needed. We used the stove, oven, grill, washer and dryer. Jackie even had laundry soap and dryer sheets. They gave us advise on fishing locations, restaurants and even numbers to call to get fish counts. We caught fish and her son packaged it for us for a nominal fee. His name was Anderson and he did a better job packaging it than professionals. The property is a bit off the beaten track and was quiet as a result. It is just a few minutes from Town. I would highly recommend staying in the apartment. Thanks Jackie. I hope we get a chance to stay again! Rates are subject to change until reservation is confirmed. Additional guests considered on an individual reservation basis for an additional cost. Check in time is 3:00 and check out time is noon.